A review of A.M. Dellamonica’s “The Color of Paradox” at tor.com. Like the past, the future has a way of getting into you and this is certainly true for Jules Wills. Knowing the end of the world was in sight, Jules and other time travellers were bounced off of that horrifying future and sent into the past. The only problem is that the brief glimpse of their future stained them, changed them bodily and mentally. Jules is stained by the future he glimpsed when in the Timepress and sees the horrible burning of that future, the smell of rotted flesh, and the strange, unnatural colours of the future every time he sleeps. Even his personality has changed and he has shifted from a non-violent person to someone who dreams of inflicting horrors on others. He feels that he has been infected with the violence that he saw at the end of the world. His body has been irreparably changed by the process of time travel and feels as though it is fundamentally damaged. A.M. Dellamonica’s “The Color of Paradox” explores notions of inevitability and the desire to change the future during a time (around World War II), when the world seems attached to an inescapable doom. Dellamonica explores the idea of time travel as an attempt to undo some of the horrors that war could inflict on humanity and shapes the idea of survival of the war as itself a form of miracle (one that this story suggests is achieved through time travellers changing the outcome). She explores the damage that war does to bodies and minds and though the PTSD and bodily damage done to her characters is a result of time travel, it mirrors the effects of war and the trauma done to those soldiers who are told that their actions are necessary for ‘saving the world’. Dellamonica puts her characters into a situation where they have the choice of either ignoring orders to save one innocent child who they are sent to kill or allow that child’s life to cause the future that eventually dooms everyone. She puts her characters in that classic philosophical question of whether they would kill one innocent child to save millions or allow the child to live and doom the huge amounts of others… and she carries her readers along for this moral ride, questioning how we would cope with this situation and react under similar circumstances. At Fan Expo Canada, I ran into Rachel Richey, part of the dynamic duo of women who brought back Nelvana of the Northern Lights. We had a chance to talk about her latest project, bringing the WWII era Johnny Canuck comics back into the public eye, recovering this lost figure in Canadian comic book superhero history. We had a chance to share in unabashed fandom and talk about Canadian comics and the role of self-discovery, the wonder of archival discoveries, the issues of superheroes who wear the flag, the Canadian desire to see our comics of the past and the power of Kickstarter as a platform for accessing public enthusiasm to bring exciting things to the public. I invite you listeners to share in our excited fandom and Rachel’s fantastic insights. Resurrecting a goddess is hard work, particularly when she is the demi-goddess first Canadian national superheroine, pre-dating the invention of Wonder Woman… but this is precisely what Hope Nicholson and Rachel Richey did this year. Through a kickstarter that I helped to fund, Hope and Rachel were able to bring Nevlana of the Northern Lights back from Canadian comic book history. Created by Adrian Dingle, Nelvana of the Northern Lights flourished during the WWII years, providing Canada with an indigenous superheroine who could represent ideas from a Canadian perspective. 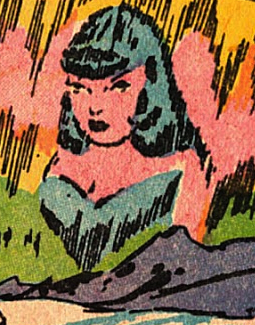 She made her debut appearance in August 1941 in Triumph-Adventure Comics. Dressed in Blue and Green with a fur-trimmed skirt and green cape (that later became a red cape) with northern lights dancing around her headband, Nelvana was uniquely situated as a figure who represented a particularly Canadian mythology of the time, being a personification of the North (literally the daughter of the Northern Lights and later taking the name Alana North for her secret identity). She claims connections to Group of Seven painter Franz Johnston, who Dingle claimed heard about her as an Inuit goddess (though it was later revealed that Johnston met an Inuit woman named Cecile Nelvana Kamingoak, who he asked to model for him). She spent most of her time battling invaders into the North, often those with aspirations involving destroying the natural environment, whether through invasive species introduction, bombing animals in our lakes, or spilling oil into rivers. Her connections to figures and ideas that have become symbolic of Canadian identity makes her a figure who can embody a Canadianness that a superhero with a flag on their chest could not attain… besides, we aren’t really the sort of country to view flag iconography as the epitome of national identity. Dingle’s creation, much like the work of the Group of Seven, ascribed a spiritual quality to the Canadian northern landscape, an otherworldliness that makes certain that The North comes with a capitalised “N” to indicate that it is more than a compass direction, but something more like a personification of a power. Producing Nevlana of the Northern Lights in black and white with colour covers, Dingle showed his mastery over the art of ascribing life and liveliness to vast, open, white spaces by drawing landscapes that, although they didn’t use the sort of backgrounds that artists drawing city-based landscapes required, he was able to fill a seemingly blank space with life and use the white space of the snowy northern landscape to imbue it with wonder. Nelvana was a figure who drew on the vast Canadian ideology of the North as making something different of us, a people forged by a landscape and a colder climate into something distinct from other nations. Dingle drew in the almost spiritual quality of the cold, using it as a testing ground for people’s strengths and abilities and as a Canadian defense against invasion in WWII by expelling people from a landscape that they viewed as hostile. Nelvana herself has a freezing breath that is able to douse flame-people in her later adventures, but she also travels into locations marked by their frozen quality, like that of the Glacians (a race from under the ice that has been frozen since the time of dinosaurs), and the Canadian government who Nelvana protects devised an ice ray to be used against Axis powers. Riding in occasionally on a polar bear, Nelvana stood as a marker for the protection of the Canadian North. 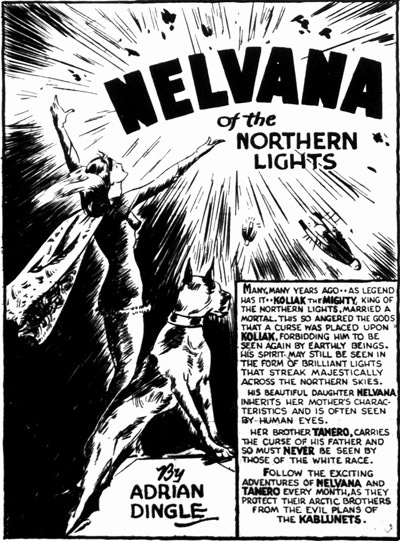 Nelvana, the daughter of the invented Inuit god of the Northern Lights Koliak and a human woman, wielded powers associated with her luminous heritage including power over light and magnetic fields which could, among other things, allow her to melt metal with the power of light and heat, render herself invisible, permit her to fly and travel at light speed, and disrupt radio transmissions. Being a demi-goddess, she also had the ability to transform her brother into various animals with a wave of her cloak, attaching her heritage to other trickster figures who have populated world mythology. In addition to her superhero crime fighting, she also took on the role of Alana North, a secret agent who foiled plots to damage the war effort and occasionally worked alongside RCMP officers to solve crimes and disrupt conspiracies. As a feminist, I was particularly drawn to the power that Nelvana brought to a comic book industry that was often unabashedly a boys-only-club. She appeared at a time when women were disempowered and often viewed as supporters for the male heroes in their lives rather than heroes themselves, but she was a heroine with incredible power and independence. Despite the incredible things that Nelvana represented, there were some issues with her representation that were endemic to the time period and social circumstance in which she was created. The Nelvana of the Northern Lights comics embodied the poor cultural representation of Canadian indigenous peoples, referring to the Inuit as “Eskimos” and portraying them as culturally backward and intellectually inferior. Many of the comics depict Inuit people constantly being tricked by others and constantly in need of rescue by Nelvana, or by members of the Canadian RCMP. Inuit people are often portrayed as obstacles to progress during the war, standing in the way of development (defined in these comics as an industrial act to support war and economic efforts). At times, Inuit people are also portrayed as being involved in race conspiracies against “the white race”. Unfortunately, these characteristics are ones that most Canadian popular media of the time was portraying and ubiquitously appeared in representations of the Inuit people by non-indigenous Canadian media contributors. The WWII context of the comic also influenced the portrayal of Japanese characters, who were depicted as being sneaky, dangerous, and dishonest. They were referred throughout the comic as “Japs”, the “yellow menace”, or the “yellow peril”. This, like the racist portrayal of Inuit people, was absolutely horrifying for myself as a modern reader to witness, but is also an not surprising given the cultural context in which it was created. After all, at the time when Dingle was writing his comics, the Canadian and American government were creating posters and other media that referred to the Japanese as “the yellow peril” and encouraged people to “slap a Jap” as part of the war effort and both governments were also placing Japanese Canadians and Japanese Americans into Japanese Internment Camps that robbed them of all rights as citizens and subjected them to regular systemic abuses. Here, the racism of the Nelvana comics was part of the general war propaganda culture. Despite the issues with the Nelvana comics, which are part of their historical situation, the re-printing of the Nelvana of the Northern Lights comics represents an act of recovery of lost Canadian voices. Many cultural contributors tend to think of the superhero genre as distinctly American, so it is important to remind ourselves that we have created distinct superheroes. After all, the origin of the superhero figure in the form of Superman was a collaboration between Canadian Joe Shuster and American Jerry Siegel, so the superhero is a collaborated North-South creation. Nelvana, as a representation of the North may be more emblematic of something distinctly Canadian than a hero draped in a Canadian flag. As a culture, we tend to take more pride in our clean water, beautiful environments, interaction with the landscape, and ability to survive the cold and an environment that isn’t easily suited to human habitation. 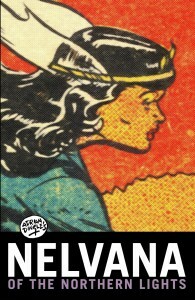 Despite the temporally-situated problems of the Nelvana comics representing racist stereotypes of the time, she also represents something distinctly multicultural as a figure who was born from Inuit roots and seems to occupy a space of question, referred to variously as white and Inuit and therefore likely representing a form of hyphenated identity. Nelvana could wear green and blue because she represented something more Canadian than red and white. She was a personification of Northern beauty, and, whether modeled after a figure from Inuit mythology or after an Inuit woman who Franz Johnston encountered, she, as a Canadian national superhero, is mythic, mighty, and magical. I have always thought that Canada needs more superheroes and Claude Lalumiere answered my wishes with Hochelaga and Sons. Hochelaga is a very typically Canadian hero. He is not interested in fighting the big battles of the world, but is interested in working with the ‘little guy’, the underdog. Hochelaga is a Jewish Montrealer who was experimented on by Nazis during the Holocaust in World War II. The Nazis, in trying to use Jewish people as experiments to eventually create a Nazi race of super-warriors instead accidentally create a Jewish superhero with powers that range from super strength to flight to the ability to learn any language. His multilingual character makes him an ideal hero for the Canadian cultural mosaic, able to speak to the diverse residents of Canada in their own languages. Hochelaga counters the Nazi focus on intolerance with his own interest in being inclusive of diversity and his ability to bring people together. Hochelaga has two sons, one who inherited all of his superpowers and another who is born with none of his powers. His superheroic son, Bernard, decides to stray from his father’s secular Judaism and instead becomes heavily interested in his own Jewish religion and identity. He finds himself disgusted at the origin of Hochelaga’s powers under Nazi experimentation and does not approve of his father’s use of that power, even if it is to further the quest for diversity. Hochelaga’s son Gordon inherits his father’s interest in the superheroic and envies his brother’s power as much as he is confused by his brother’s disinterest and dislike of that power. When Hochelaga dies, both sons are called to question their moral positions. 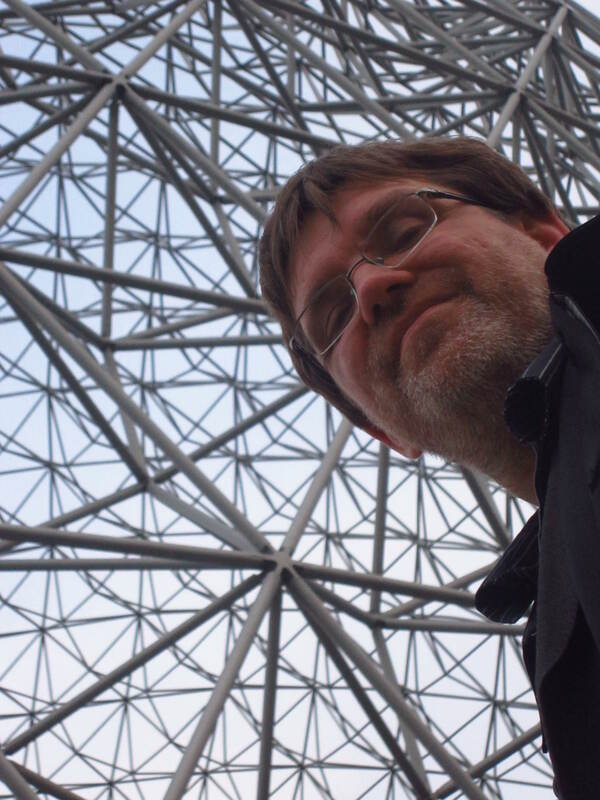 Photo of Claude Lalumiere (Appropriately Located In Montreal). Photo by Camille Alexa. superhero and superheroic story that causes his audience to question what makes a good hero and develop a renewed interest in supporting the underdog. Lalumiere reminds his reader that the battle against intolerance is ongoing and requires constant vigilance.